Today, March 7, 2017 is a date that has been encircled in so many people's diary. Its a day that the legal fire works between Biafra and Nigeria which started several months ago is expected to come to a climax with the Judgment of the Ecowas court. One thing is definitely sure - all eyes will be focused on the Court sitting in Abuja today in order to ascertain the outcome of the case between Nnamdi Kanu (Biafra) vs Buhari (Federal Government of Nigeria). 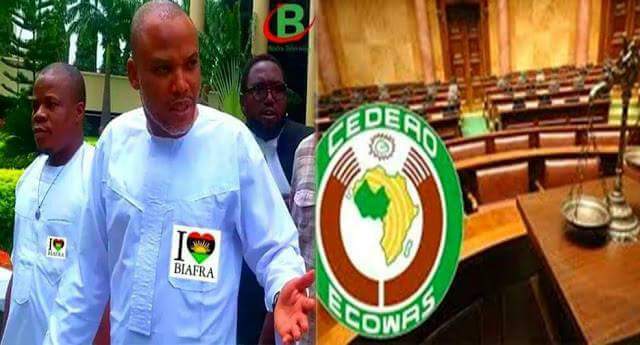 The outcome of the Ecowas court case whether implemented by the federal government of Nigeria or not will go a very long way in exposing the country has a lawless country of savages which is a term that Nnamdi Kanu was recently quoted to have used to address the contraption. A country that does not obey the judgement of her own courts. Read also:BIAFRA: NOW THAT BINTA HAS DECLARED IPOB LAWFUL, WHAT HAPPENS TO THE SLAIN? What Biafrans expect from the Ecowas court is justice which has been denied them by the federal government of Nigeria. Be reminded that the leadership of the indigenous people of Biafra some months back took the federal government to the Ecowas court seeking enhancement of her leader's fundamental human right, Nnamdi Kanu as well as damages of N2billion for his illegal detention by the Nigeria authorities. Will justice be finally done on this case? That is one question we hope will be answered today and only few hours from now will tell.